ExLooking for rent a Grading Blade Attachment for a Bobcat Mini-Excavator in Rochester NY, Ithaca NY and Western New York? The Duke Company is proud to feature Bobcat Mini Excavator equipment in our rental fleet..
Transforms a compact excavator into a high productive resource for finish grading, backfilling and leveling. Essential attachment for constructing slopes. 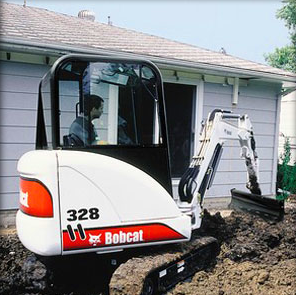 Use the Hydra Tilt or Power Tilt swing accessory from Bobcat to contour slopes. Ideal for grading and leveling any terrain that you are working with. Essential for applications including: backfilling trenches, leveling earth, completing and finishing grading, shaping drainage ditches, construction mounds and grading landscaping areas.